Use the link below to purchase the book from the publisher. MWH Vol 1 is an outstanding publication that should be read by anyone remotely interested in the history of professional wrestling. Unlike many other venue or city themed record books that only list cards, this particular project on Memphis Wrestling History has both the advertised lineups and the results of the cards... More over, just as they appeared in the newspaper. It's a very easy book to follow and the book will give the reader countless hours of enjoyment. I could spend hours writing how great this book by Mark James is. Do yourself a favor. Buy a copy and find out for yourself. Back on the market and available again! After a problem with our previous publisher, we regretted having to take our first book off the market. 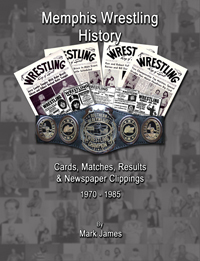 Memphis Wrestling History is very happy to announce this book is back on the market! This book was created as a labor of love. From endless hours spent at the microfilm machine, to all the editing time the scans took to clean up. The result is the most detailed look at Memphis Wrestling's Monday night wrestling cards that's ever been created. Memphis Wrestling held weekly matches for decades and this book has those cards and results for the years 1970 thru 1985. The cards were printed in each week's Sunday newspaper and then on Tuesday's the results would be printed as well. This book features all the great Memphis wrestlers, like Jerry Lawler, Jackie Fargo, Bill Dundee, Tojo Yamamoto, the Fabulous Ones, Al & Don Greene, Joe LeDuc, Jimmy Valiant, Austin Idol, Randy Savage, Rocky Johnson, Tommy Rich, Eddie Gilbert, Tommy Gilbert, The Sheepherders, the Moondogs, Jimmy Hart, Jim Cornette, the Rock n Roll Express, the Midnight Express and so many more! The book is 8.5"x11" and has 332 pages. The cost is $#23.99 and the book can be purchased at AMAZON.COM. The foreword was written by former Memphis Wrestling manager Scott Bowden. If you ever want to see what happened in Memphis Wrestling, this is the book for you!